Did you know that 20 million people nationally provide 5 million hours of volunteer service per year? That is a donation of services at a value of $482 million annually. For the past 20 years, the Whitehall Public Library has been greatly benefitted from the donation of time and talent by Faustino Dunckhorst. 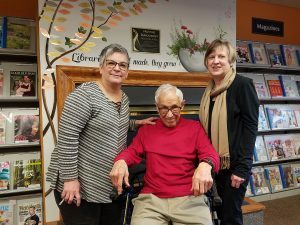 Recently, the Library dedicated the “Faustino Dunckhorst Reading Area” in recognition of the all that Mr. Dunckhorst has done for the Library, and the library community at large.